Enjoy all the comforts of home ? right inside your tent! Perfect for rainy days or evening gatherings! tent Designed by visionary Eureka!? camping specialists, the E! Power? 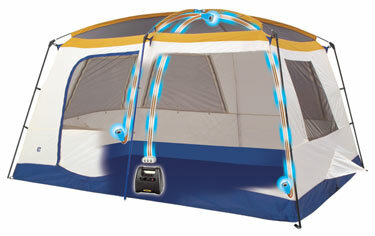 System integrates three factory-installed 12-volt outlets inside the N!ergy tent with Eureka! ?s exclusive E! Power Pak? *, a portable & rechargeable battery, to power your favorite 12-volt accessories right inside your tent for the ultimate in camping comfort! * E! Power Pak sold separately.